If you follow our blog you may have seen my past mentions of Tiggly through my product reviews and mentioned in my posts about our favorite learning apps. My daughter is six and absolutely loves Tiggly, so needless to say when we received Tiggly Words she was super excited to download the apps and start playing! Tiggly Words is an interactive tablet toy geared for children ages 4 to 8. Inside the Tiggly Words package you receive five vowel toys, a pouch to store your letters, and three free, downloadable, learning apps. Through these apps children solve problems, play games, and build words to help them become more familiar with literacy skills such as building words, long and short vowel sounds, phonics, and nouns and verbs. 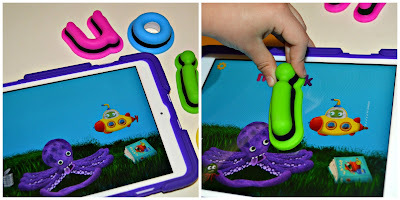 I love that the Tiggly combination of physical toys and learning apps encourage interaction, help to build motor skills, and help with spatial reasoning. Tiggly Tales: With Tiggly Tales children can make new words by replacing the vowel in CVC (consonant, vowel, consonant) patterns. Children will learn CVC patterns, short sounds, words building, and story telling. Tiggly Submarine: In the underwater world of Tiggly Submarine children will learn simple words with short vowel sounds, spelling patterns, and exploration. On their adventures they will meet some funny characters! 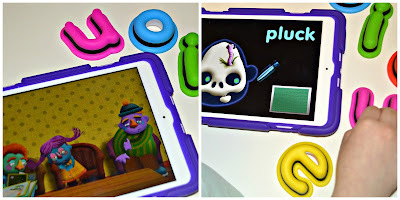 Tiggly Doctor: This silly app teaches children verbs, long and short vowel sounds, and flexible thinking. Children get to fix the funny patients who fill their waiting room. 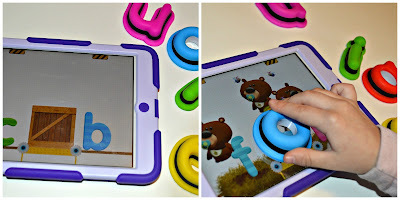 I love that each Tiggly app that goes along with Tiggly Words teaches different skills and in different ways. Because of varied approaches to teaching these letter skills children are able to stay engaged and have fun while learning! Visit the Tiggly Website HERE!